Last year world renowned photographer Glen Wexler asked me to join his team for Epson’s new brand campaign. Although he is the son of Palm Springs architect the late Donald Wexler, Glen’s work centers on advertising and supra real photographic illustration. It is because Glen has a strong understanding of the importance of architectural rendering that he sought me out. He wanted my input on how to approach panoramic views of New York and Tokyo, and add futuristic building design to the existing cityscapes. Once the locations and view angles were chosen Glen and producer Jeremy Alter travelled to the sites and created two spectacular photographs to work with. Glen chose to make them both wide angle panoramas which meant my expertise was needed to solve many interesting perspective issues. 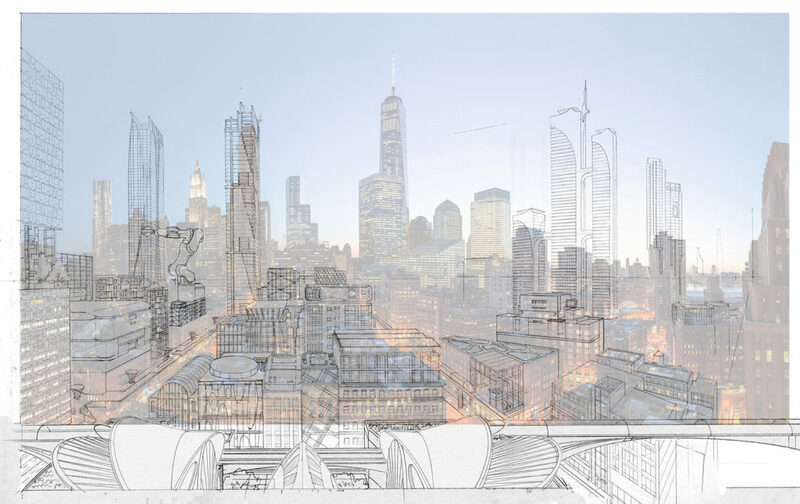 I chose to set the foreground in the New York view as a one point projection, to naturalize the scene. 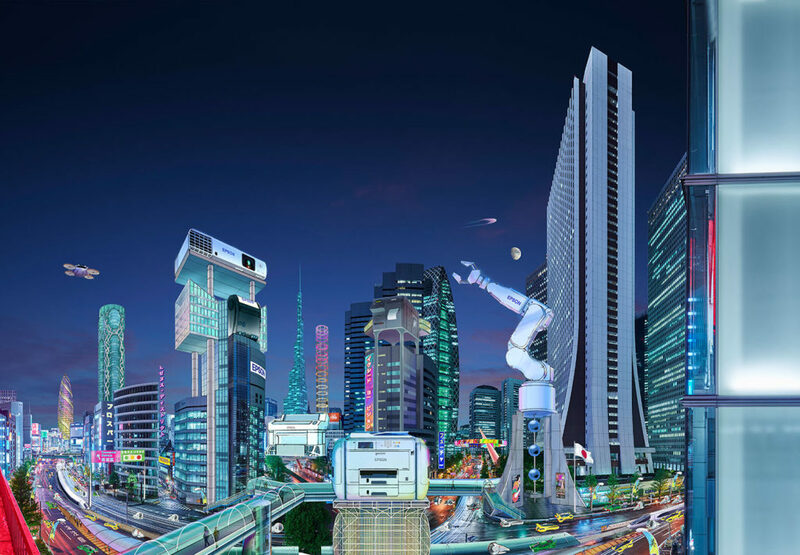 Then I worked closely with Glen and the agency’s art directors to create buildings that were designed around future technologies. 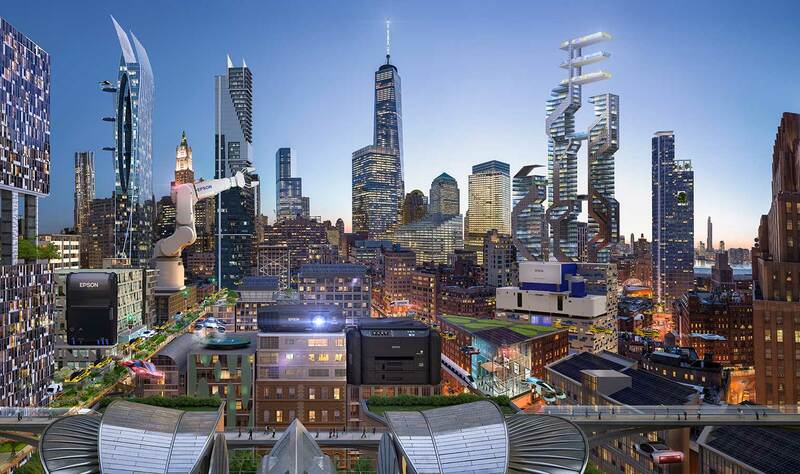 I was careful to scale my designs to the existing city scape In the New York view so that the digital team, led by Alen Petkovich, would be able to place their models accordingly. I am adamant about scale in conceptual art. It is crucial to creating believable perspectives. 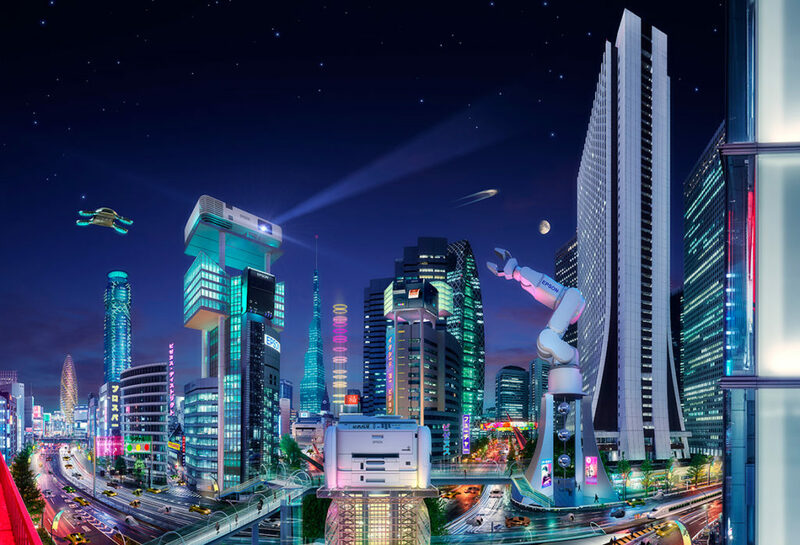 A prime directive was to incorporate Epson products as architecture into the city scape. These items included printers, scanners, projectors, mobile retail printers and robotic arms. 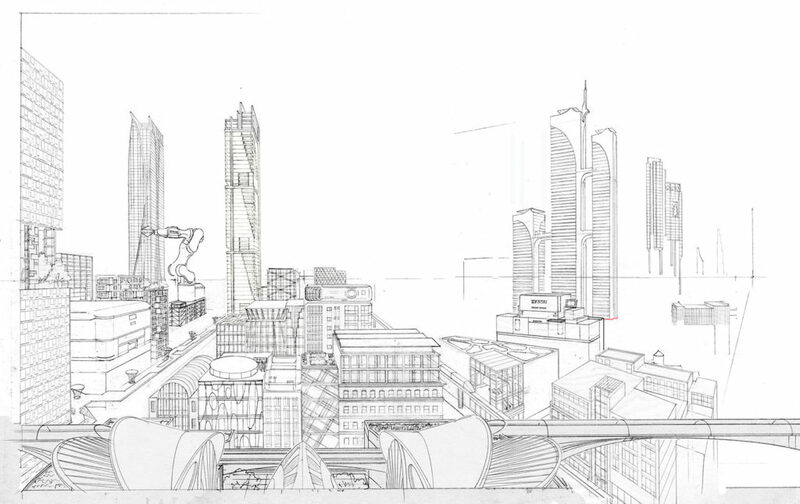 We studied them in various positions and scales to synthesize them into the city fabric. Working in advertising means incorporating a many design directives as well as continual refinement of ideas. Every element was carefully rendered and evaluated. These images are designed to be shown across multiple formats from mobile device, to desktop computer, to large scale digital displays. It has already been seen in New York’s times square, and will be shown in Airport mediascapes. Glen was also commissioned to produce a digital animation. He created an exciting fly through incorporating live model action, that I was happy to story board for him. There is also an Epson ‘behind the scenes’ video. The second view is Tokyo’s Shinjuku ward, which already has a futuristic feel. Although the image also is a wide angle panorama, the foreground street actually describes an S curve at the point where the photograph was taken. This led to many interesting perspective issues in connecting elements that stretch across the view to join various areas . For this view I teamed up with Digital Frontier to produce the beautiful finished rendering. When you compare my conceptual sketch with their incredible digital rendering you get a sense of our capabilities as a team. I am proud to partner with a studio capable of matching the scale, perspective and design details I worked into the conceptual painting. Working with the amazing photographer Glen Wexler and his producer Jeremy Alter was exciting, challenging and a thoroughly rewarding experience.